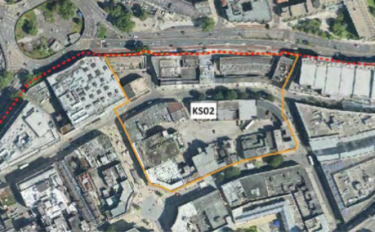 ‘Callowhill Court’ is the name given to a huge redevelopment of a large part of Broadmead, including changes to traffic and bus routes in the whole area. We’ve been paying close attention since the initial proposals in December 2016, and there have been significant changes, however as members and strong supporters of Living Heart for Bristol, we are very much in agreement with the points they raised 1000 Space New Car Park and 4-Lane Road in Bristol City Centre Would be Madness! Many of these issues remain despite the revised plans of July 2017 reducing parking to 500, with improvements to cycle routes and permeability and 670 cycle parking spaces. There’s even a new route proposed from Gloucester Road to Broadmead avoiding St James Barton roundabout and two small ‘cycle hubs’ one on the corner of Lower Castle Street, the other on the NE corner of the new development. The key document is “16_06594_P-APPENDIX_A13.1_TRANSPORT_ASSESSMENT_-_VOLUME_2_PART_2-1686425.pdf”, we’ve extracted out Figure TAA4 showing the bus, pedestrian and cycle routes. Bristol Cycling Campaign believes that everyone deserves safe, attractive space for cycling on all Bristol’s streets. We welcome the target in the council’s Bristol Cycle Strategy for 20% of trips to work by bike by 2020. We are concerned that the proposals in this consultation will discourage cycling. Further hinder access to the shopping area by cycle. A major through route is closed to cyclists and cycle parking provided only at the periphery rather than within the area development. Do not provide protected cycling space on main roads, or remove through motor traffic. Make cycling more dangerous for cyclists and other vulnerable road users, with poor design features. Demonstrate a general lack of competence in cycle facility and urban environment design. There is also insufficient attention to detail resulting in omissions and puzzling features. We are particularly concerned by the closure of Horsefair to cycling, the disconnected cycle routes in a number of places and dangerous cycle lane designs near bus stops. Horsefair is the natural through and access route for cycles and cannot be replaced by a poorly designed pavement cycle path on Bond Street. The proposal to do so shows a lack of understanding of the design principles for car free public spaces with free cycle and foot access, as is normal on the continent. The proposal to provide cycle parking at the periphery is part of this lack of understanding. Short term shopper cycle parking needs to be distributed among the shops. Consequently, Bristol Cycling Campaign objects to the proposals. (d) No eastbound provision for cycles to travel contraflow on Horsefair, resulting in more journeys by bike needing to be made on busier roads. (e) No westbound provision for cycles on Horsefair, resulting in more journeys by bike needing to be made on busier roads. (f) Pedestrian crossing at the eastern end of Horsefair near Primark appears to have been removed. (i) Disconnection between northbound cycle lane on Union Street and westbound lane on Broadmead, meaning cycles need to dismount for approximately 20 metres. (j) Unclear whether northbound cycle lane on Union Street is physically segregated – this will be essential to avoid buses swinging into path of cycles when departing the stops. (k) Unclear whether existing pelican crossings on Wine St/Newgate/Union Street are being retained, removed or added to. Development should safeguard and enhance heritage assets including historic parks and gardens – this development will route traffic to the car park through the historic Portland and Brunswick Squares Conservation Area, resulting in increased traffic, noise, severance and pollution. (a) Development should mitigate climate change by encouraging [sustainable] journeys rather than car – this site is in one of the most accessible within Bristol but the development is designed to encourage a majority of trips by car, without attempt to change existing conditions. (b) No specific change to the baseline conditions towards more sustainable modes is proposed within the framework travel plan, which contains no targets, contrary to the DfT Guide on Travel Plans for Developers. (e) Car parking land should instead be used to increase the % of site for housing (including affordable). As a pedestrian I hate sharing the pavement with cyclists, as a cyclist I hate sharing the pavement with pedestrian. Markings are vague and it leads to confusion on both sides. I cycle far less in Bristol than when I’m staying out of town which is a shame. Poor design of cycle routes based on an apparent lack of understanding of cycling seems to be at the heart of this. The lack of sensible (and secure) spots for parking bikes also plays a role. Bristol Cycling seems to have made some very sensible observations and I hope they will be acted on before any final decisions are made.